The American Guild of Organists fosters the appreciation and enjoyment of organ and choral music through recitals and workshops. FIRST BAPTIST CHURCH was organized in 1845 as an arm of the Dillon Creek Baptist Church. The congregation worshipped in different locations, including a log church originally built by the Presbyterians, until erecting their first permanent building of Greek Revival design in 1856, located at Sixth and Francis. Construction of the present building began in 1895. The basement was occupied in 1897, and the balance of the building in 1901. 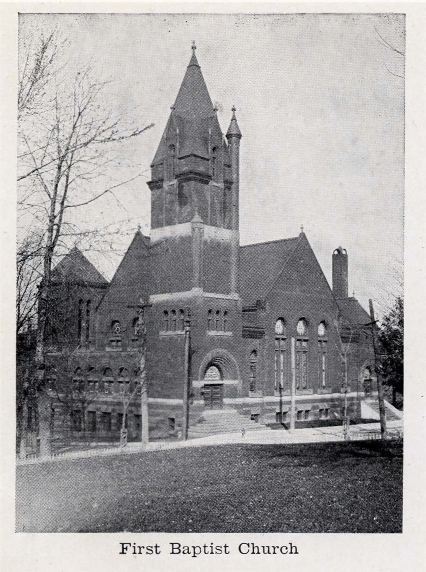 The building was designed by local architect, Edmund J. Eckel, a graduate of the Ecole de Beaux Art in Paris, and follows the Romanesque style, which was popularized in protestant churches in the latter part of the nineteenth century by Henry Hobson Richardson. The auditorium-style sanctuary features outstanding Victorian stained glass windows in geometric patterns and a barrel vault ceiling executed in white oak. 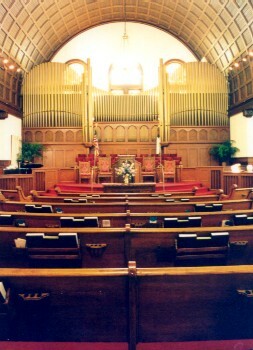 Until the Sunday School building was added in 1928, Sunday School classrooms adjoined the sanctuary via roll-up doors. St. Joseph’s newest pipe organ was recently built by Quimby Pipes Organs, Inc. behind the case of the Bennett Organ Co.’s Opus 832, installed in 1915, which replaced a previous 3 manual organ built by the predecessor Moline Organ Co. and installed in 1902. While the previous organ featured stenciled case pipes, the 1915 organ featured a gold-painted pipe fence, an emerging style. The round top arches on the pipe display imitates the Romanesque architecture of the building. The new organ incorporates pipework from the 1915 organ which was re-voiced, re-scaled and re-pitched for inclusion in this instrument. Early photo of exterior. Note the rounded entrance (visible on the main crawl page) on the left (South) elevation is not there...apparently added after this photo. Updated February 18, 2010 . © 2000 Allied Arts Council of St. Joseph, Inc. Special thanks to CCP Online for hosting this site. Funding for this site has been provided by the Missouri Arts Council.